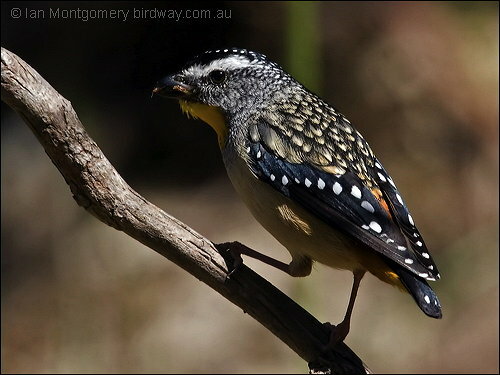 Pardalotes or peep-wrens are a family, Pardalotidae, of very small, brightly coloured birds native to Australia, with short tails, strong legs, and stubby blunt beaks. This family is composed of four species in one genus, Pardalotus, and several subspecies. The name derives from a Greek word meaning “spotted”. The family once contained several other species now split into the family Acanthizidae. Pardalotes spend most of their time high in the outer foliage of trees, feeding on insects, spiders, and above all lerps (a type of sap sucking insect). Their role in controlling lerp infestations in the eucalyptus forests of Australia may be significant. They generally live in pairs or small family groups but sometimes come together into flocks after breeding. Pardalotes are seasonal breeders in temperate areas of Australia but may breed year round in warmer areas. They are monogamous breeders, and both partners share nest construction, incubation and chick rearing duties.